Plus, there's the FREE photo voter ID program that has issuing offices in all TEN of the counties mentioned in the OP. Michigan closes down and consolidates SOS offices all the time. I'm sure the city of Detroit, which has a majority percentage of African Americans, has seen it's number of offices shrink as the overall population of Detroit has declined from 1M in the 1960's to the 450,000 or so it has today. Has Michigan disenfranchised the residents of Detroit by closing secretary of state offices? Notice how many counties with a very small percentage of blacks had their offices closed. Looks like 8 out of 10 counties with a black population greater than 50% had their DMVs closed as opposed to 5 out of 13 where the black population is less than 10%. That's what? Like 80% vs 38%? Basically the same thing... ? And this doesnt even take into account that free id's to vote could have been obtained at registars offices that stayed open in every county, and that you could call and have an ID delivered directly to your house. Are you arguing that most people will not be using a driver's license for ID? Now let's pretend that you're going to vote in three weeks. You're license expired/you lost it/whatever, you can go to the DMV and get a new one. Or you could request a mobile ID (that's what you're referring to with the "delivered directly to your house") unit come to your house. Which are you more likely to do? Oh wait, you can't do that because you have to contact them at least two weeks in advance and sorry, schedule is filled. But wait, are you a currently registered voter in AL? If not, you can't even get a free voter ID in the first place. Because it would make too much sense to allow the people issuing that ID to also register you to vote. But wait, you can register to vote online... oh sorry, can't do that if you don't have a valid driver's license or state ID. But guess where you can register to vote? Why of course, the DMV! So excepting specific circumstances (like you're a registered voter with all the required ID documents except a valid photo ID and have enough lead time — good for invalids no doubt), aside from the DMV, you're left with the registrars offices. It's pretty damn tedious just talking about it. Meanwhile, other people are just heading off to the DMV. If nothing else, you at least have to admit that they cut access to the most practical means for complying with the law by half and that this measure disproportionately affected predominately black counties. Voter suppression doesn't have to completely disenfranchise a group. It doesn't even have to impact a majority of the members of the group. Nor does it have to be an absolute denial. It really only needs to be enough of inconvenience with disproportionate impact to discourage or otherwise keep a small percentage of the target group from voting. But here are some real facts. 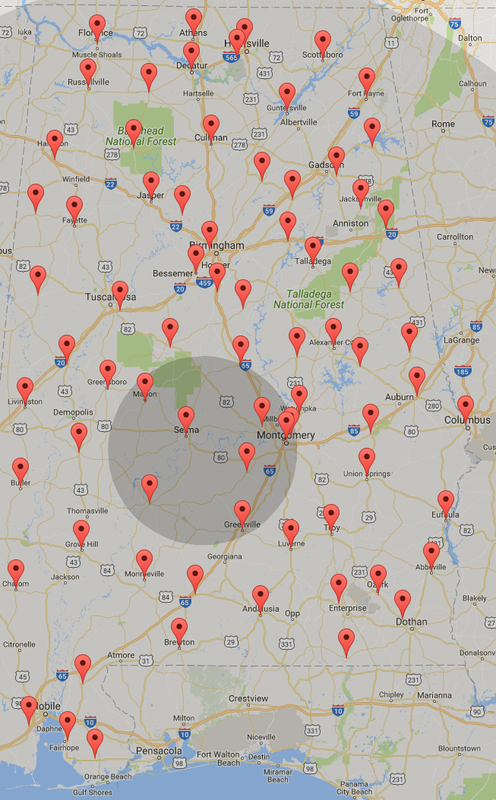 There are 67 counties in Alabama. The eight affected counties are the LEAST populated counties in the state. 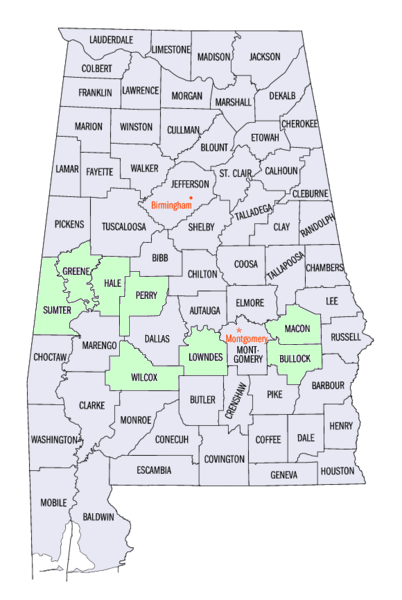 Alabama's total population is 4,779,736 people. The TOTAL population of those eight counties is 96,657 or essentially 2% of the entire state population. When one considers the actual black vs. white counts and population above 18 years of age, the number of blacks 'inconvenienced' by this (we can ignore the inconveniences perpetrated against the white residents of those counties) is obviosly significantly less than 1%. Moreover, using the DMV office locations in the link above, it is clear that many of those counties never actually closed, but reduced hours. Something that is also true in many other counties throughout the state. No single 'affected' county appears to be more than an hour's drive from an open location. The entire premise of this thread is BS disinformation.
. Those offices closed seem to be relatively evenly spaced apart like they were trying to eliminate redundant offices State-wide, not going after a particular ethnic group. They reopened those offices in question, so the point is a non point even. What now is preventing people from getting proper ID to vote? I'm not a fan of any law requiring an ID that has a fee attached to vote. (yes, there's free ones, but only if you meet the requirements). Just issue free state ID's to everyone beginning at 18 yo. and be done with it. It's free, you have every opportunity in the world to get it. Everyone's is happy. Or here's one. Let's force women to register for selective service as well. Make this your ID for voting. So you dont care about the 5 almost all white counties that were affected. Screw whitey, right? Only the black people can be disenfranchised. This wasn't a racial thing at all. It was done in counties with low populations. Again, though, if this is your standard, then DMV distance is less of an affect of white vs. black, but rural vs. urban. Rural people much have to go much further to get to any government office, including the DMV. And guess what, rural people are overwhelmingly white. So by your standards, the voting system is set up to disenfranchise white people. Now in this thread particularly, you even acknowledge that the registrars office can give you an id. Why is that a problem again? Im sorry, but I dont find your story here to be that persuasive. Yes, if you left your id expire, waited until the week before the election, tehrfore cant get the mobile ID, so you for whatever reason dont feel like going to the registrars, and dont want to drive an extra 30 miles to get your ID renewed, sorry, tough luck. By the same token, if I let my license expire and I live in the middle of corn country in Nebraska and have to drive 60 miles to get my ID renewed, does that prove racism against white people? This thread, like all claims that Voter ID is racist, is merely attempting to call opponents racism. and it makes it seem like you are infantilizing black people, claiming they cant accomplish simple tasks like getting an ID. please explain coherently how this = racist ?